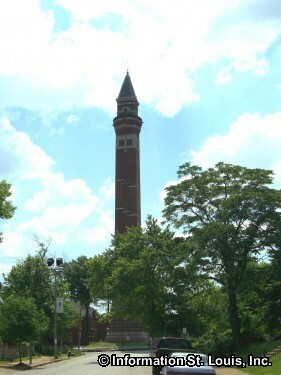 The Bissell Water Tower was completed in 1886 and stands 194-feet tall. Being built in a Victorian architectural style, it is thought to have influenced some of the styles of the surrounding buildings in the College Hill Neighborhood. It was taken out of service in 1912 and suffered from the disuse and neglect. It used to have an inside spiral staircase that went to the top to an outside balcony. Concerned citizens kept it from being razed and a grant from the U.S. Department of the Interior that was matched by the city of St. Louis allowed it to be completely renovated in the 1970s. Out of the seven water towers that are still in existence in the United States, St Louis is home to three. The other two water towers are the Grand Water Tower and the Compton Hill Water Tower. These three water towers located in St. Louis are each over a century old, being built in the late 1800's. They are actually standpipe water towers and were built to equalize the water pressure in the city. The old steam driven water pumps that sent water through the city also caused large surges in the water pressure which caused the pipes to rattle and shake. 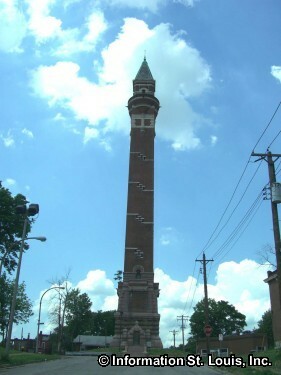 The towers were built around the standpipes for aesthetic purposes and now each of them are on the National Register of Historic Places and are St Louis Landmarks. Bissell Water Tower "New Red"